How do our boards compare to other deck materials? It’s hard to deny that composite wood decking, with its attractive appearance and minimal maintenance requirements, is one of the best decking products on the market. But not all composites are created equal, and if you’re looking to install a deck of your very own, you need to ensure that you’re using the very best materials! Click the links below to discover how TimberTech composite decking compares to other types of decking – or click here to view our decking comparison chart. While hardwood decks are made of solid timber, composite deck boards are created using a combination of wood and polymer. The quality of these two materials has a huge impact on the stability and calibre of the finished deck; there are many different grades of composite wood, and we at TimberTech only provide the very highest. TimberTech's UV stability leads the market, and fade is less than 10% over 3 years. Some other types of decking fade by as much as 40% after a couple of months! 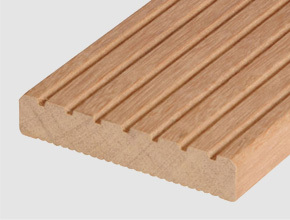 TimberTech deck boards have a very high density, which makes them more rigid than other products on the market. 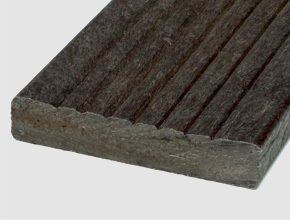 Some composite deck boards bend by up to 40% more than TimberTech boards. Furthermore, in product testing, several other types of decking expanded by up to 40% more than TimberTech decking. 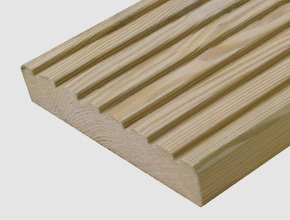 We pride ourselves on the performance of our products, and TimberTech boards reach saturation at a very low level, ensuring that water is kept out. Other composite boards absorb over 30% more water, leading to expansion of up to 30% in length and as much as 25% in height. How Are TimberTech Boards Made? TimberTech’s manufacturing process uses recycled hardwood and high-grade polyethylene to produce something truly unique: quality deck boards that perfectly emulate the beauty of solid wood while bypassing the strenuous maintenance requirements that make other types of decking so problematic. The reclaimed wood that we use would otherwise be headed straight to the landfill, and we take pride in the fact that no trees are felled in the making of our decking products. Some different types of decking are made using recycled plastic, but since these materials can break down over time and cause severe issues for the deck owner, we only ever use top-quality virgin plastic. Click here to order a free sample of TimberTech’s high-quality decking, or contact us now to learn more about what we have to offer.